I have mom guilt that I don’t have my kids do enough cleaning around the house. I see those graphics on Facebook that say if your six-year-old can operate a smartphone, he can do his own laundry, steam clean the carpet, and aerate the lawn, and I feel guilty. I do involve them in tidying up, sorting laundry, dusting, and doing windows but I get a little nervous about handing them a harsh cleaner or a bleach wipe and having them go to town. I frequently use vinegar for cleaning purpose, but it does tend to make our whole house smell like a pickle. I found some tutorials online for toning down the vinegar scent with orange peels and decided to use that process to make some homemade orange cleaning wipes that I am okay with my kids using. 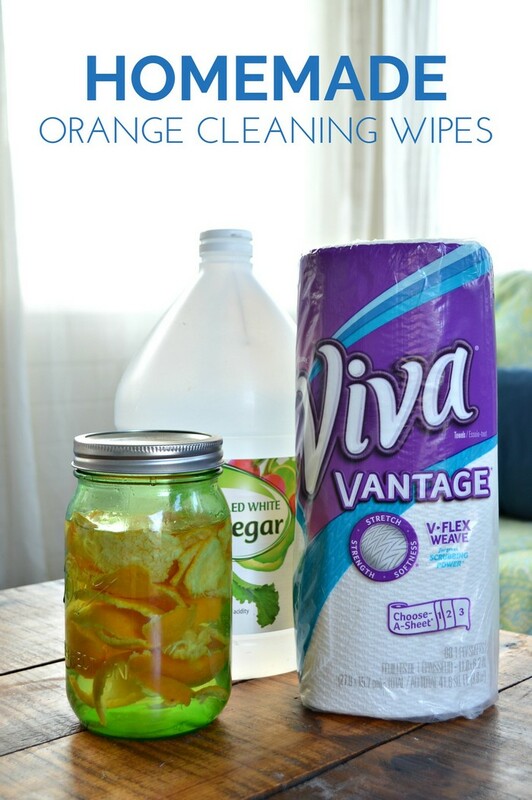 How Do You Make Homemade Orange Cleaner? First, you will need to make a batch of orange cleaner. Don’t worry, it’s crazy simple. 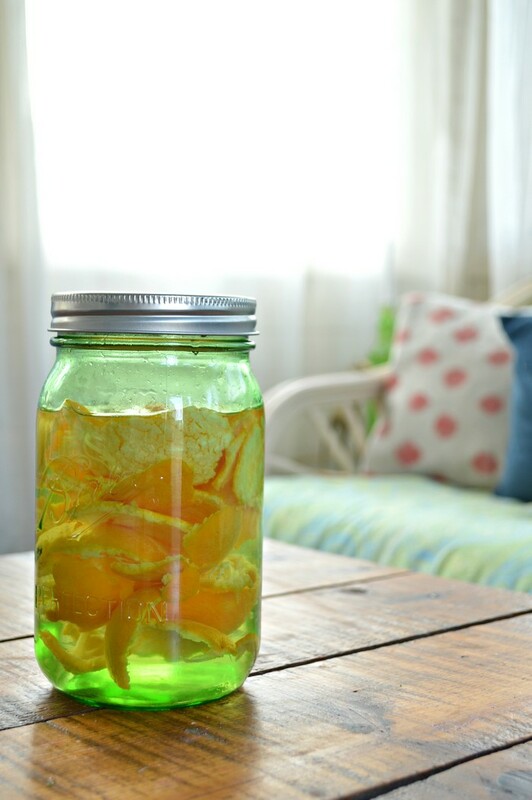 Peel up a bunch of oranges, enough to fill a quart sized mason jar at least 2/3 of the way. Fill the jar with white vinegar, and screw the lid back on. Let it set in a cool, dark cabinet for at least 10-14 days. You just made orange cleaner. 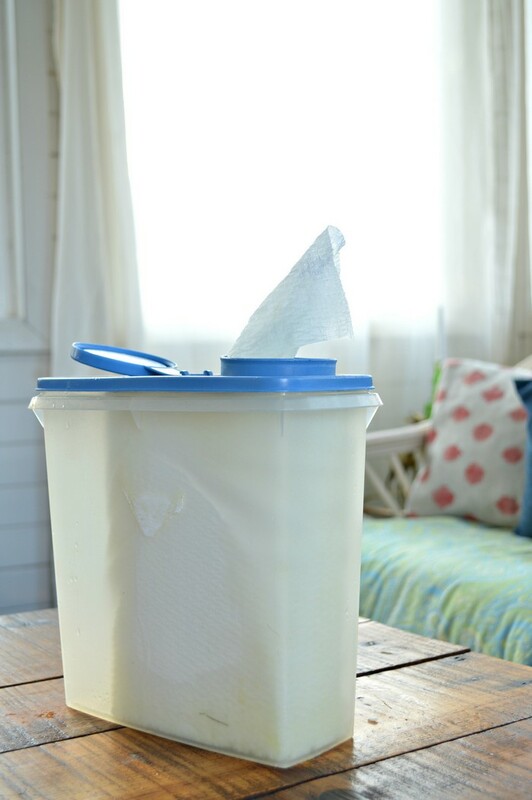 How Do You Make DIY Cleaning Wipes? Once the orange cleaner has steeped for the necessary amount of time, it’s time to make up the wipes. You really want to use a nicer quality paper towel for these wipes. Cheap towels will disintegrate before you get any use out of them. I like to use Viva® Vantage® because they have a scrubby texture, like a terrycloth. They are great for getting appliances and glassware to shine or for scrubbing stove tops and other grimy surfaces. 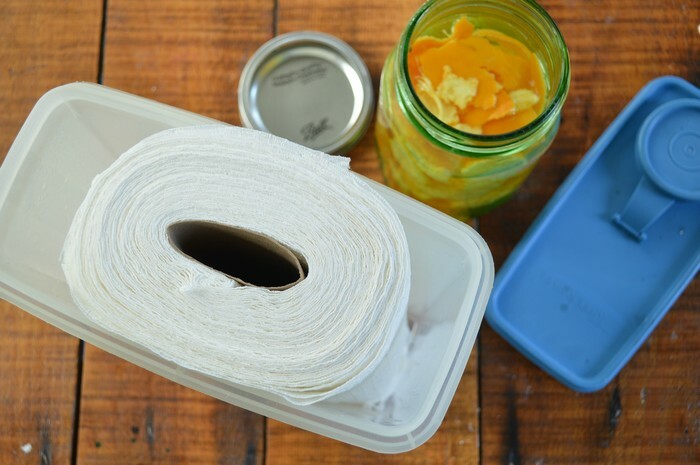 You will need to find a plastic container that will fit the roll of paper towel’s width. 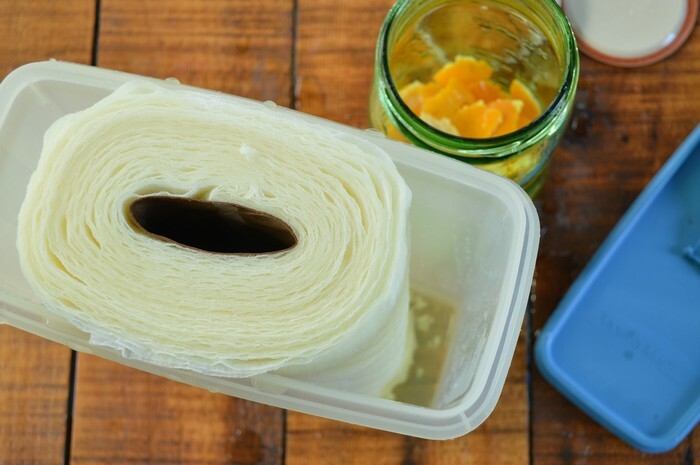 You can cut the roll down to size if the container isn’t tall enough (bread knives work perfectly) but you need to be able to shove roll’s girth down in the container. Bonus points if the container has a small flip top opening like mine has. You will see why later. Squish the roll right down into the container. 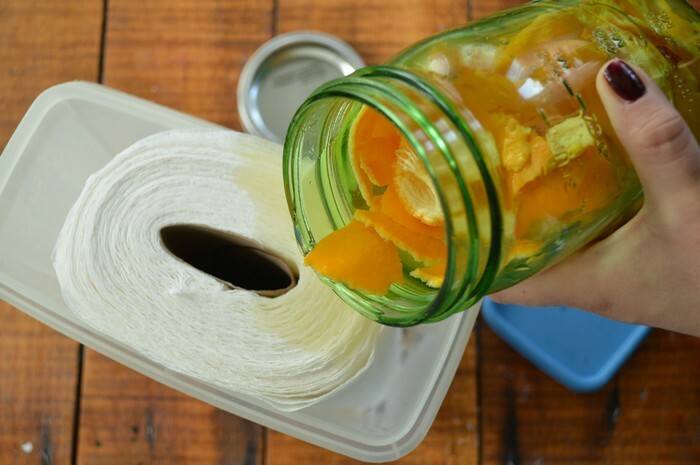 Pour the orange vinegar over the paper towel and into the bottom of the container. Don’t worry if initially there is some pooling at the bottom of the container. The paper towel will wick the liquid up into the roll in minutes. 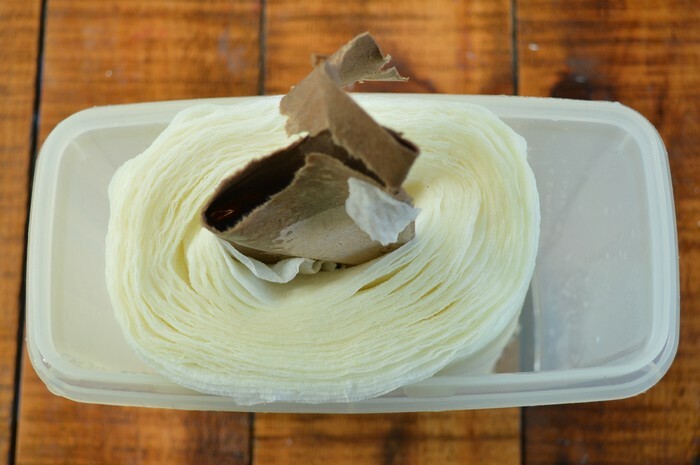 Once the liquid has been absorbed into the towel, you should be able to reach in and remove the softened cardboard center of the roll of paper towel. 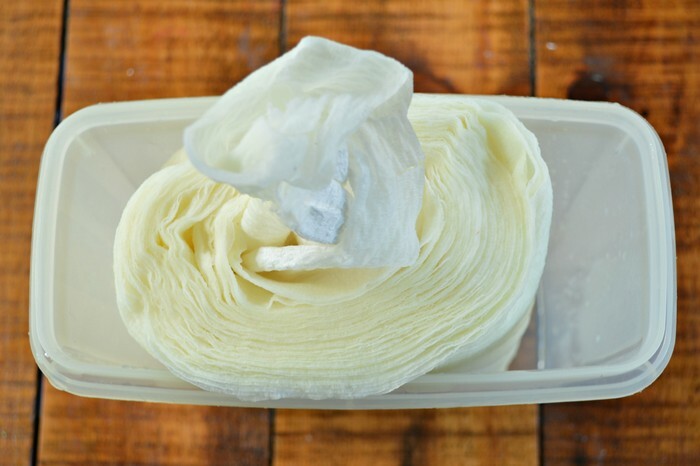 Now you can pull out single sheets of paper towel from the center of the roll, just like store-bought cleaning wipes. 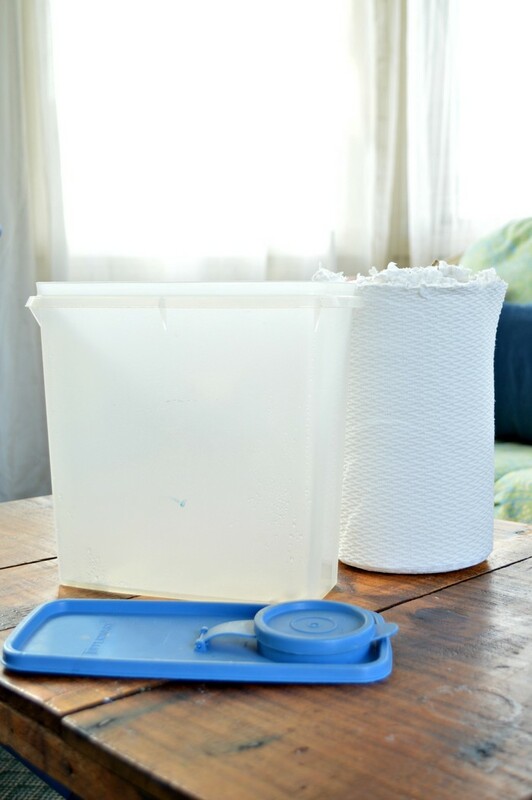 Pop the top back onto your plastic container, and thread the wipes through the flip top opening — if you have one. Just grab out a few sheets whenever you have a quick mess that needs to be wiped up. The wipes do still leave behind a bit of a vinegar smell, but the orange is very helpful in masking it. What cleaning chores do you have your kids help with around the house? Do you incorporate homemade, natural cleaners when you clean?